Aggressively caricaturing Stephen's expectation of sympathy, Mulligan charges that "you sulk with me because I don't whinge like some hired mute from Lalouette's." 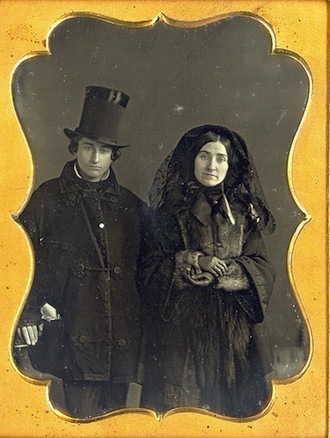 In Victorian and Edwardian Britain, these professional mourners were hired to stand around the home, church, or cemetery, looking somber, sad, and sympathetic, and wearing certain prescribed forms of formal black dress. Lalouette’s, Gifford notes, was a Dublin mortuary whose rental services included mutes. Mutes also served as pallbearers. In Hades, they carry Paddy Dignam's coffin from the carriage at curbside: "The mutes shouldered the coffin and bore it in through the gates." Slightly later, they bear it "into the chapel." The word "mute" appears fairly often in Ulysses, in various forms. In most cases it simply means "unspeaking," but on at least one occasion it seems as if Joyce may be punning on the functions of funerary mutes. As the carriages approach Prospect Cemetery, the men inside catch glimpses of the many white stone sculptures adorning graves: "Forms more frequent, white shapes thronged amid the trees, white forms and fragments streaming by mutely, sustaining vain gestures on the air." Perhaps other uses of the word contain some remnant echoes of these stylized gesturings: the apparition of Stephen's mother, for instance, "that had bent upon him, mute, reproachful."